Easily set the time and program the auto brew feature. Sneak-a-Cup- Temporarily stops the flow of coffee so you can pour your first cup. This coffee maker is as much beautiful as it is functional. The black color with the silver trim is very trendy. It is a 12 cup programmable coffee maker. You can set the time on it as well as set it to brew at a certain time. It is very easy to use and the area where the standard filters go along with the water is large to prevent spilling when pouring the water in. the basket comes out to make it easy to empty and clean. It has the feature where it stops brewing if you remove the coffee pot to pour a cup before brewing is completed. The programmable face lights up and is easy to see. It is simple to program making is so user friendly. The only thing that I wish was different was that the cord is very short, but it has a place in the coffee maker that the plug can be tucked into when not in use. It is fine for me because I have a coffee counter with an outlet right there, so it needs to be very close to an outlet. It brews quickly and keeps the coffee hot til it is turned off or it also has a 2 hour auto shut off. After making coffee in the morning at a friends house, I really wanted to get one of my own. So when this came up I had to get it. It was a lifesaver during the days leading up to Thanksgiving. It was very simple to use, having only used a few of these in my life I needed simple. There is a pamphlet of course so if you have any questions it's easy to look up. The only mentionable issues that I had with this coffee maker was a filter issue and the spring sealer that stops the coffee from pouring out when you take the pot away from it. The filter issue was an easy fix, although a bit annoying to have to do every time. If you did not wet the coffee filter and make sure it is stuck to the sides, then it will fall in on itself when the water is flowing. Happened every time I didn't wet the filter first. Not a deal breaker, but the one my friend had didn't require this step. The second issue I had was with the spring sealer. When I would remove the pot it would leak at the seal so I would have to wait for it to finish before removing it. After a few times of using it, it did get better and just do a few drips. I guess the heat reshaped it to fit better. So with that pretty much fixing itself, there are no other problems I had with mine. It makes a great cup of tea as well! I was lucky enough to receive this for free for testing purposes, but I did check the price and it isn't a very expensive coffee maker. 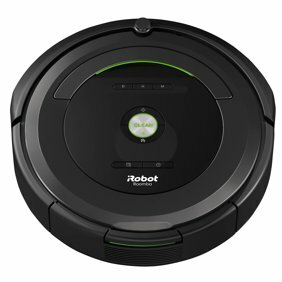 Definitely work the price and makes for a good starter one if you don't want to spend much. I love the black and silver design. Black and silver to me seems so modern for some reason. And it matches all my other appliances and little things on the counter tops. Nothing beats the classic coffee maker design I think. I am not a person who is first drawn to things beyond the basics. this is a very handy design I do think. Added features does help make a busy morning much more manageable. Black and decker is a very reliable brand I have always thought. I like a whole pot of coffee warmed up to the perfect hot temperature rather then the pots that make one cup at a time. I like to control how strong my pot of coffee is. This can of course be used for other things. whenever you need hot water just leave out the filter and things in the filter part of course which I have done many times. From tea to oatmeal, that can come in handy when your running around dealing with many morning things at a time. This has a quick touch programmable clock and timer. sneak a cup is an added bonus I think. Why wait if you do not have to. two hour auto shut off. Ever leave the house or lay down at night and wonder if you turned off the coffee maker? Oh yes I have, many times. I am a bit obsessive compulsive about such things so the auto shut off is a feature what frankly puts my mind at ease. Besides ever try a cup of coffee that has been on the hot plate for hours? The coffee turns to oily sludge. I would rather make a pot let it get cold and warm up a cup as I want it rather then have that sludge. Removeable washable brew basket. A handy tip is to use tooth brushes for it. I keep cheap ones set aside just for small hard to reach cleaning tasks. Makes a great cup of coffee. Very consistent. Basket not a cone filter. That's important. Has a place to store the cord. A see through area to see how much water is in the machine, water levels. Has an auto brew. Touch pad programming. Easy to read, push, and use. Nice coffee maker. With just enough extras to make your busy mornings a bit easier. I would highly recommend this coffee maker. 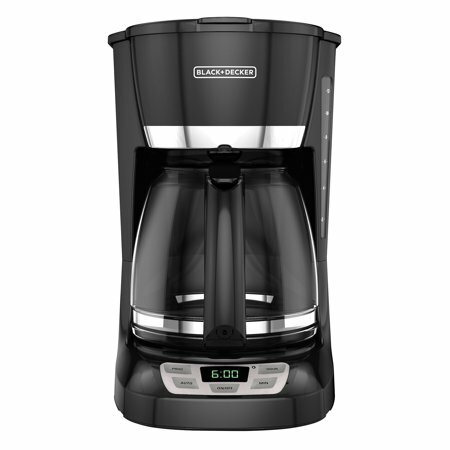 The Black & Decker 12-Cup Programmable Coffee Maker, in black, is a very nice and simple to use coffee maker. I cannot get going in the morning without having my coffee and I found this coffee maker a nice addition to my morning repertoire. The instruction manual was simple to follow and I had no problem using it. I found that the carafe has a great pour spout that did not cause any of the water when you pour it into the unit or the coffee as you pour it into a cup, to spill; I have had issues with water/coffee spilling down the side of the pot because the pour spout was a bit too short. I really enjoyed using the programmable option for setting the coffee to brew in the morning automatically. I set the machine up before bed and found that it was simple to follow the instructions for programming the coffee maker for the proper time. It was very nice to wake up to the smell of freshly brewing coffee in the morning. I have never used a programmable coffee maker before because I was concerned about it being too complicated but this machine has made me see what I've been missing. WE GOT THIS COFFEE MAKER BECAUSE IT WAS PROGRAMMABLE. IT IS EASY TO SET THE TIME AND EASY TO SEE WHETHER IT IS DAYLIGHT OR NIGHT TIME. WE USE IT FOR A CLOCK AS WELL. IT IS ALSO EASY TO PROGRAM. YOU JUST HAVE TO LOOK FOR THE LITTLE DOT TO MAKE SURE YOU HAVE IT ON AM OR PM. FOLLOWED THE DIRECTIONS TO CLEAN IT FOR THE FIRST USE. SET THE CLOCK AND TIMER FOR THE NEXT MORNING. VIOLA, HAD COFFEE WAITING. THE COFFEE TASTED GOOD. NICE TO HAVE COFFEE WAITING FOR YOU. WE ALSO LIKE THE COLOR BLACK AS IT DOES NOT SHOW ALL THE DRIPS AND STAINS IN THE FILTER AREA. PREVIOUSLY, WE HAD A WHITE ONE AND IT WAS NOT PROGRAMMABLE OR EASY TO CLEAN. THE COLOR WHITE SHOWED EVERYTHING EVEN AFTER CLEANING IT WELL. THE BUTTONS ARE EASY TO SEE AND EASY TO USE. IT FITS ON THE COUNTER NICELY. IT IS A LITTLE TALLER THAN THE ONE WE HAD SO WE HAVE TO PULL IT OUT FROM UNDER THE CABINETS TO PUT THE WATER IN. THE FILTER AREA IS EASY TO GET TO. IT IS EASY TO PUT THE FILTERS IN AND TAKE OUT. YOU CAN ALSO GET A CUP OF COFFEE WHILE IT IS STILL MAKING IT. THE COFFEE MAKER HAS A DEAL THAT STOPS THE COFFEE FROM COMING DOWN IF THE CARAFE IS PULLED OUT. IF YOU LEAVE THE CARAFE OUT TO LONG THOUGH, THE FILTER AREA COULD OVERFLOW WITH COFFEE. WE JUST WAIT UNTIL THE COFFEE IS DONE MAKING WHICH IS WAY THE TIMER IS NICE. OVERALL LIKE THIS ITEM VERY MUCH. I previously owned a Black and Decker CM 1060W and used it several times daily for years. When it wore out I replaced it with the same one unfortunately the new one must have had a manufacturer defect as it only lasted several months. I am confident that Black and Decker will want to replace it for me. Thank you for offering your feedback regarding your Black+Decker CM1060W. I’m glad that your coffee maker was working well at first, but I’m sorry to hear that it has stopped brewing properly. The satisfaction of our customers is vital to us. Please reply to the email I’ve sent you from youropinionmatters@spectrumbrands.com so I can address your concerns. I have a really nice brewing machine, that I like very much. It is 10 1/2" wide, 10 1/2" deep and 14" high, which is pretty big. It makes my choice of either a single cup of coffee or hot water for tea. It is very convenient for me, as I am a single dweller who sometimes prefers tea and who doesn't drink tons of coffee. However, the problem was it was not very convenient, when I had an overnight guest or company for dinner. I needed a new coffee maker, that made an entire pot of coffee, that I could use occasionally, when the need arose. This Black & Decker Coffee Maker suits my needs, perfectly. It is only 8" wide, 8 1/2" deep and 12" high, so it takes up less room on my counter, than my other machine, and it also takes up less room, to be stored, when I am not using it. It's a nice, compact size. This coffee maker is easily programmable, and came with easy to understand instructions, written in several languages. It is easy to set the time, easy to set the timer and has a warming plate that stays on for two hours (this was not noted in the instruction manual, that I could find, so I had to figure it out for myself). It makes up to 12 cups of coffee and uses the round coffee filters, not the cones. My previous full pot coffee maker was weird, as I would fill up to the 10 cup line, make the coffee and would have only 8 cups in the carafe, after the coffee finished brewing. Where the heck did the rest of the coffee go? I could never figure it out, other than to think the rest of the water must have evaporated. With this coffee maker, when I fill it to the 10 cup line and make the coffee, I get just about 10 cups back in the carafe, after brewing. Thank you! I would definitely recommend this coffee maker. It's a great, easy to use, little machine. This Black and Decker Coffee maker is one of the poorest coffee makers I have ever had. It is poorly made and does not live up to the Black and Decker name of what I remember. I washed it completely and ran filtered water and the vinegar threw it and it seamed fine. So I ran 2 rinse pots of filter water threw and was all happy about using it for the first time. So I put my grounds in and filtered water and pushed the brew button. I came back about fifteen minutes later to pour myself some coffee and took a sip and it was not even warm. So I went ahead and tried to brew another pot and this one was the same just warm. Really disappointed. The style of the maker is sleek and looks great. But it can't brew coffee at all. Sad. All the features seem to work fine. Something has to wrong with heat generation part or something. Would not recommend to anyone and if had been paid for, I would sending it back and looking toward another brand. 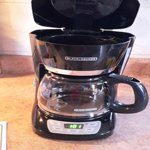 This Black & Decker 12 cup programmable coffee maker has all of the features that a more expensive brand coffee maker would have. It has quick touch programming buttons, 24 hour auto delay brew time setting, sneak a cup of coffee before brewing is finished feature, a heavy duty glass carafe and a large easy view water level window. The problem is that it is made from very light and cheap materials. I have only used it for one week but I cannot see it working very long. The on/off switch buttons underneath the digital control labels are not even in the center of the push button area. But the biggest problem is with the brew basket where the coffee grounds go. For some reason it does not sit correctly over the carafe lid without fussing with it. If you don't get the basket perfectly aligned it will overflow water and coffee grounds all over your counter as it did to me. What a mess! The water also covered the hot plate going inside of the base where all of the electronics are located. I don't feel comfortable using the auto delay brew setting because of this. So in my opinion this coffee maker is useless to me.